Five undergraduate majors are offered by Carnegie Mellon Qatar: Biological Sciences, Business Administration, Computational Biology, Computer Science, and Information Systems. All five majors require four years of full time study to earn a Bachelor of Science degree. Yes. In fact, minors are required for students majoring in Business Administration and Computer Science. Students can minor in any one of the five major subjects offered, as well as other select disciplines. Self-designed minors are possible with permission from the academic advisor. Is it possible to study abroad or spend a semester on CMU's campus in Pittsburgh? 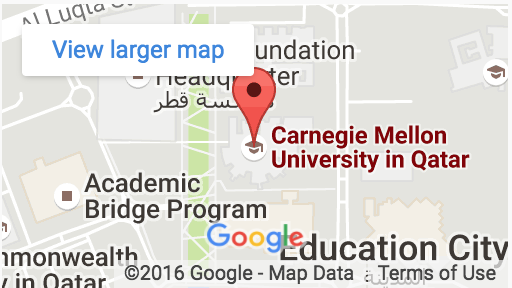 Yes, Carnegie Mellon Qatar students may apply to study on the Pittsburgh campus for one semester. Qatar campus students may study abroad for a second semester at another institution (not CMU Pittsburgh) if an appropriate opportunity arises and their academic advisor agrees. Is it possible to transfer to the main campus in the US after beginning on the Qatar campus? Yes, it is possible, although most majors in Pittsburgh have very few open spaces for transfer students. Yes, it is possible for students to double major within Carnegie Mellon Qatar in Computer Science and Information Systems, or Business Administration and Information Systems. Students should expect an additional year of study in order to complete requirements. Students must start with one major during their first year and then petition to double major. What is the academic calendar at CMU-Q? The first semester starts in late August and ends in mid-December. The second semester starts in mid-January and ends in mid-May. Qatar Campus holidays include Qatar Independence Day, Eid al Fitr, and Eid al Adha. Does CMU-Q offer summer courses? Yes, approximately seven to ten courses are offered each summer. Does CMU-Q offer courses for part-time students? No. All five majors require full-time study for the Bachelor of Science degree. Do Carnegie Mellon students in Qatar receive the same education and degree as the students on the Pittsburgh campus? Yes. The curriculum and the degree programs are identical to those offered at the Pittsburgh campus. All faculty members are appointed through their respective colleges on the Pittsburgh campus. Some faculty members are based in Qatar, and others are based in Pittsburgh and teach in Qatar for either long- or short-term residencies. All graduates of Carnegie Mellon Qatar receive their degrees from Carnegie Mellon University. Students are awarded the same diploma in Qatar as on the main campus. What kind of student is Carnegie Mellon Qatar looking for? At Carnegie Mellon we take a holistic approach to the application review process. There are many factors that we consider: academic performance, standardized testing results, and non-academic performance. We’re interested in seeing that you’ve challenged yourself in secondary school. Your secondary school performance will be the main factor in our admission decision. Standardized test scores add to our knowledge of your ability, but we don’t make decisions simply on the basis of test scores. Your non-academic activities, including extracurricular accomplishments, part-time jobs or hobbies, and community service also play a very important part of the admission process. We look at non-academic information to develop a sense of your personality, motivation and sense of responsibility. What does holistic admission mean? Holistic admission means that all of your grades from years 10, 11, 12 (and year 13 in the British system), along with your test scores, personal essay, recommendation letters, and extracurricular activities are reviewed before an admission decision is made. No single grade or test score determines whether a student is admitted; instead, we do a comprehensive review of your file. What is the best way to prepare academically for Carnegie Mellon Qatar? Prospective applicants should take a broad range of courses during their secondary school years. More information on preparing for CMU-Q. Do international students need a visa to study in Qatar? Yes. International students who enroll at Carnegie Mellon will apply for a visa sponsored by Qatar Foundation. The initial visa is valid for one year and renewable for the remainder of the program. Students must be enrolled full-time and maintain student status in order to keep the visa valid. Once a student has been admitted to the university, more information and guidance will be provided. Is it possible to apply for admission to both the Doha and Pittsburgh campuses? Yes, students can apply for admission to both campuses, but separate applications are required. Admission decisions are made on each campus independently. Transcripts and recommendation letters must be received directly from the school or teacher via the Common Application using an official school email address. SAT or ACT and TOEFL or IELTS must be sent to us from the testing agency. The official IELTS score report can either be sent to us directly from the British Council or mailed to us by the student or school. The official documents in their original language must be included along with the translated version. How can I find out if my documents arrived? All applicants will receive a link and access to a portal within 24 hours of submitting their online application. The portal will allow applicants to see what documents we have received for them. Is it okay to email scanned copies of my application documents? What documents do I need to submit if I am reapplying? We require all applicants to complete an online application including those students who have applied previously. Since we keep admission documents on file for one year, we do not require those students who applied to Carnegie Mellon Qatar within the past year to re-submit official documents. However, students will have to submit any additional testing (SAT or ACT and TOEFL or IELTS, AS and A-levels, and so on) they have taken. Students who enroll at another university will be required to submit their university transcripts, and more recent recommendation letters are preferred. Is it possible to submit documents like school transcript and letters of recommendation in a language other than English? In order to be considered for the admission process, all documents must be in English. Please have all non-English documents translated by an official translation and certification agency. I'm having trouble logging into my online application. What should I do? Please email ug-admission@qatar.cmu.edu and explain your problem. We will ask you to provide your name and birth date so that we can identify you. There is an error in the information submitted with my application. What should I do? Please email ug-admission@qatar.cmu.edu and explain your problem. We will resolve the errors to make sure that accurate information is included in your application. Are standardized tests required of all applicants? Yes, the ACT or SAT and the TOEFL or IELTS are required, no matter which type of school curriculum you come from. These tests are also required for transfer applicants. Is there an exemption policy for the TOEFL and the IELTS? Yes. The TOEFL or IELTS can be waived if you have a score of 600 or higher on the SAT Reading and Writing Section, or a score of 26 or higher on both the English and Reading sections of the ACT. Does Carnegie Mellon Qatar have minimum score requirements? No. Standardized test scores are one factor considered in the admission decision and there are no absolute minimums. Because admission to Carnegie Mellon Qatar is highly selective, however, the higher your test scores, the more likely you are to be admitted. Does Carnegie Mellon Qatar super score standardized tests? Yes. Carnegie Mellon University in Qatar selects and considers a student’s highest subscores of every standardized exam (SAT or ACT and TOEFL or IELTS) he or she has taken. Is it okay for my test results to come after the February 1 application deadline as long as I submit the online application by February 1? All required documents must be received by February 1. Please plan to take all tests at least one month before the application deadline so they will be scored and reported on time. Interviews are available to all applicants and they are strongly recommended, but not required. Interview times are available Sunday through Thursday during normal business hours (9:00 to 17:00). The majority of admission interviews take place on the Doha campus. Are interviews done before or after the application deadline? All interviews are done before the application deadline of February 1. Students are encouraged to interview earlier, as interview slots in the final month of January tend to fill quickly. Is there a separate process to apply for a merit scholarship? To be considered for merit scholarships, students should submit the CMUQ QF grant application. Students are notified of any merit scholarship awards at the same time they receive their initial Financial Award Letter from CMU Qatar. Merit scholarship awards are made in a similar manner to our admission decisions with a holistic process involving many factors. When do I submit my financial aid application to Qatar Foundation? For students entering in August 2019, the financial aid application will be submitted after receiving an offer of admission or a wait-list offer. Admitted students have two weeks from the offer of admission to submit the CMUQ QF needs-based grant application. The process is done entirely online through the Qatar Foundation website. Why are some students offered admission and others not? The first factor is whether a student has met the admission requirements of the university. Given that the number of qualified applicants can exceed the enrollment space, admission is competitive and the strongest applicants are thereby offered admission. The number of acceptances Carnegie Mellon Qatar offers each year depends on the desired class size for each program. What is the acceptance rate at Carnegie Mellon Qatar? For 2016-2017, the acceptance rate was 38.5%. There were 675 applicants, 265 were offered admission, and 100 students enrolled. How many new students does Carnegie Mellon Qatar expect to enroll in 2018? Carnegie Mellon Qatar plans to enroll up to 105-110 first year students in Fall 2018. Can an offer of admission be rescinded? Yes. In cases where a student’s grades drop after being admitted to Carnegie Mellon, an offer of admission may be rescinded. Every enrolling student’s final transcript must include final grades that are consistent with the grades presented to the selection committee at the time the offer of admission was made. Does Carnegie Mellon Qatar offer conditional admission? No. Admission decisions are made using information available at the time the application is reviewed and all decisions are final. Admitted students who enroll at Carnegie Mellon are required to submit a final transcript before they can register for classes. Final grades must be consistent with the grades presented to the selection committee. If a student’s grades have dropped after an admission offer has been made, the offer may be rescinded. Does Carnegie Mellon offer admission to transfer applicants? Yes, students who wish to transfer from their present university are welcome. Note that SAT or ACT scores are still required. How can I know how many credits will transfer from my present university? A formal transfer credit evaluation will be given to admitted students shortly after the admission offer is made. Transfer credit is considered on an individual basis, and Carnegie Mellon University in Qatar may award elective credit for courses with no Carnegie Mellon equivalent. Transfer applicants should be ready to submit course descriptions of university courses they have taken if requested to do so. Transfer credit for courses that you are taking while we are reviewing your exiting university record depends on successful completion of each course. Grades are not transferred—only credit. Sometimes transfer students have to take specific courses and accumulate a larger total number of courses than the normal amount required for graduation. The time it takes for you to graduate will depend on the time you need to complete the full university degree requirements, not on your class standing at a previous institution. Can transfer students receive Financial Aid? Does Carnegie Mellon Qatar offer post-graduate programs? Post-graduate programs are not offered in Qatar, but they are offered on the U.S. campus. Please see http://www.cmu.edu/graduate/ for more information. Does Carnegie Mellon Qatar offer an MBA program? Does Carnegie Mellon Qatar plan to offer an MBA program or any other post-graduate program in the future? Presently there are no plans to offer an MBA program or any other post-graduate program in Qatar. Does Carnegie Mellon Qatar offer online, distance-learning, or part-time programs? Online, distance-learning, or part-time programs are not offered in Qatar but are offered on the U.S. campus. Please see http://www.cmu.edu/academics/distance-learning.shtml for more information. Carnegie Mellon Qatar’s programs are all full-time undergraduate programs requiring residence in Qatar.